This was the most tender chicken ever! 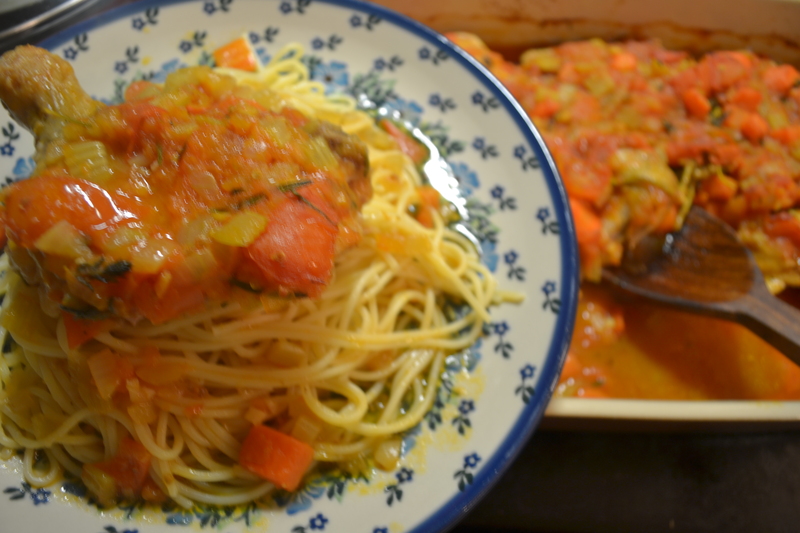 I didn´t have any homemade pasta on hand which would have made this dish even better. Chop onions, carrots and celery into rather small pieces – not too small though. Sweat in a little olive oil, before adding the finely chopped garlic. Then add the white wine and when it has evaporated a bit – add the stock, herbs and chopped tomatoes. Let it simmer while you fry the chicken in a separate pan. Dust the chicken pieces in the flour, seasoned with salt, white pepper, cayenne pepper and sweet paprika. Fry till slightly golden brown. Put the pieces into an oven proof dish, pour the sauce over and cover with foil. I let it cook at 150 degrees for at least an hour, then removed the foil and let it cook at 180 degrees for another half an hour or so. It was very tender and extremely flavorful. I think I´ve said it before and I´m just about to say it again…. Make your own stock. Served with spaghetti and parmesan….